Electric cars have finally gone mainstream. And the audience for this new technological craze extends far beyond just car enthusiasts. The innovative technology supporting electric cars is constantly evolving; and their introduction to the masses is here to stay – supported by mandates from many nations who have placed a timeline on an end date for the manufacturing of gas engine driven cars. Thus, without question, all car manufacturers are adopting this shift in industry technology – covertly and overtly – led by Telsa galvanizing the industry. More and more electric cars are spotted on the freeway today, zooming by elegantly without use of even a single drop of fossil fuel pumping throughout the car. Most of these electric cars are powered by amazing lithium-ion batteries, which have become the corner stone to the electric car technology; making the shift from gas powered cars to electric cars possible for consumers today. Without advancements made with lithium-ion batteries, the electric car industry simply would not exist today in its current advanced, yet infant, form. Therefore, to better understand lithium-ion batteries, we’re going to learn how these batteries work in electric cars and discuss their good and bad characteristics. Our goal is to become better educated and familiar with these batteries. A heavy, yet sleekly designed battery pack, is typically located under the floor of every electric car; as pioneered by Tesla. The battery is strategically positioned and placed to create a low center of gravity for better driver handling, and to open more interior space for passengers. 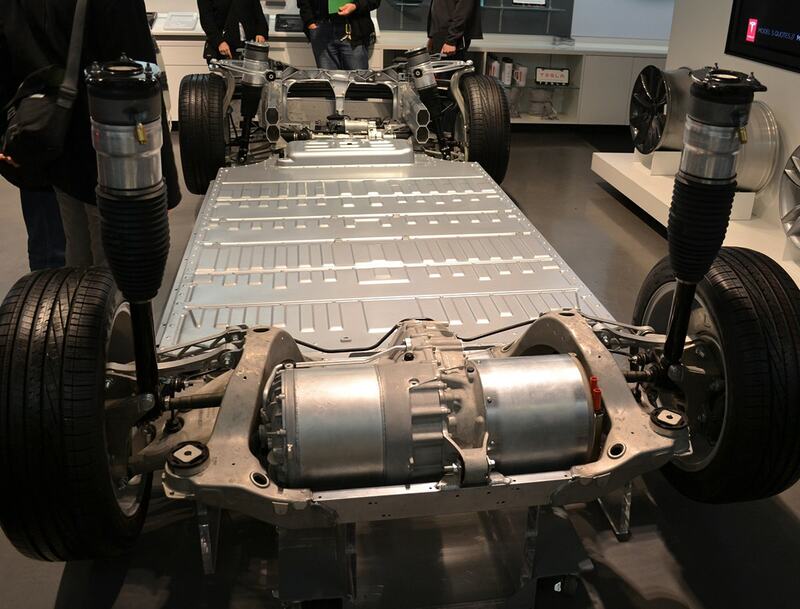 We see pictured below how the battery discretely and uniformly covers the floor of the car. The battery pack stores electricity to power the electric motor that spins the wheels of the car. The wheels of the car continue to spin until the charge of the battery pack is depleted. Once depleted, the battery pack must be recharged – similar to recharging your smart phone by plugging it into an electric outlet. With an electric car battery, however, a special electric wall socket or a dedicated charging unit station must be used. Currently, Tesla is leading the industry with their supercharger network of stations that are sprinkled across the country for drivers to charge their cars. 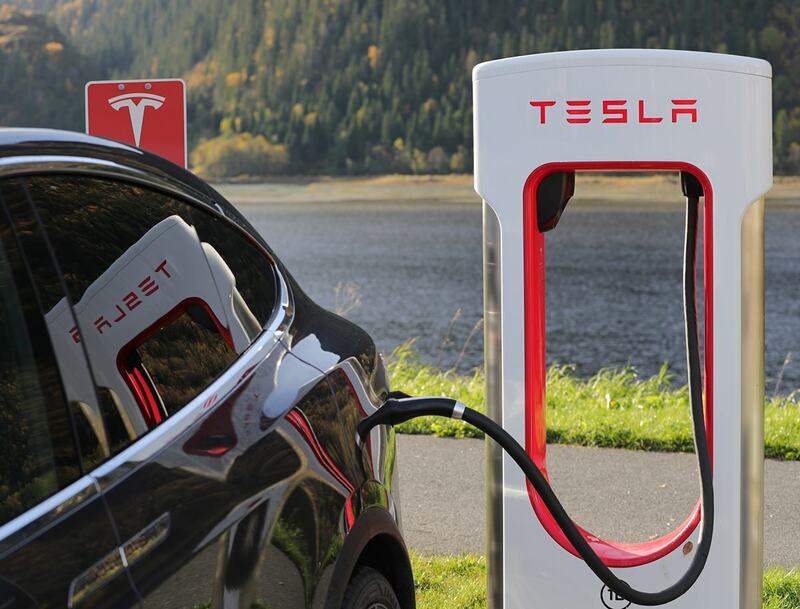 Similar to gas stations, the supercharger network is making electric cars more and more appealing to everyday people – as it is both convenient and practical. With our quick summary regarding electric cars and batteries completed, we will now dive into greater detail about the batteries themselves; as they are the heart of the electric car movement. There are two key factors to consider in determining how a battery will perform. First, there is energy, which can be represented by the driving range of the car – how many miles the car can go in a single charge. Second, there is power, which can be thought of as the acceleration of the car – how fast the car can go from 0 to 60 miles per hour. Now, to create a descriptive design variable for electric cars, a mathematical ratio is used: the power to energy ratio (P/E). The P/E ratio displays the amount of power per unit of energy that is required for a given application. Thus, the P/E ratio is a general design parameter. And it is important to note that the value is influenced by the vehicle’s weight, top speed, acceleration, and electric range. For example, a high P/E ratio indicates a short electric range, and a low P/E ratio indicates a long electric range. Also, it may be inferred that the heavier the car, the less distance the car can travel; as more energy is required in order to move a larger mass. Additionally, the greater the acceleration and top speed, an increased chance that the electric range will be reduced; as greater energy is required to potentially drive and accelerate the car faster. Now, using the computed P/E ratio for a battery, the design specs for the desired type of car can be fulfilled in order to produce the ideal driving experience through the car’s performance. The battery is constructed from several electrochemical cells, which consist of both positive and negative electrodes. When the electrodes are electrically connected together with wires inside of the car, lithium ions move between the anode and cathode. This movement of lithium ions creates an electric current, which in turn powers the car’s motor. In this discharge cycle of the battery, lithium in the anode, which is a carbon material, is ionized and goes out to the electrolyte. The lithium ions then move through a plastic separator that is filled with microscopic holes towards the cathode, which is a lithium metal oxide. Then once the lithium ions reach the cathode, they go into atomic sized holes. All the while electrons are released from the anode, and this movement of electrons becomes the electric current that flows out to an external electric circuit. Thus, when charging these batteries, lithium ions travel from the cathode to the anode through the porous separator, and because the process is a reversible chemical reaction, the battery can be continuously recharged through the recreation of this described process. Understanding how rechargeable batteries are constructed, combined with knowing that the battery that is most often used in electric cars is rechargeable lithium-ion batteries, will allow us to begin to uncover even more. Lithium-ion batteries have distinct advantages over other battery types: they are not too heavy, have ideal recharging characteristics with no memory effects (where a battery seems to become more difficult to charge, unless it is discharged fully first), relatively long life cycle, and are low in maintenance. Because lithium-ion batteries cannot put high energy and power per unit of battery mass together, the battery is smaller and lighter than other rechargeable batteries, which is ideal for an electric car. Now, looking over data provided by the University of Tennessee’s college of engineering below, we can see the accumulated data over various battery types, and the amount of energy that they each hold per a unit of weight. The bar graph clearly displays the superiority of lithium-ion batteries over the other rechargeable battery types. This characteristic of lithium ion batteries is very important, because if the car is weighed down too much by the battery mass, it becomes more difficult for the car to reach higher speeds and accelerate; and the increased mass will, in-turn, reduce the distance the car can travel. Thus, without these advantageous lithium-ion battery characteristics, an electric car would not be successful and would pale in performance compared to gasoline engine powered cars. 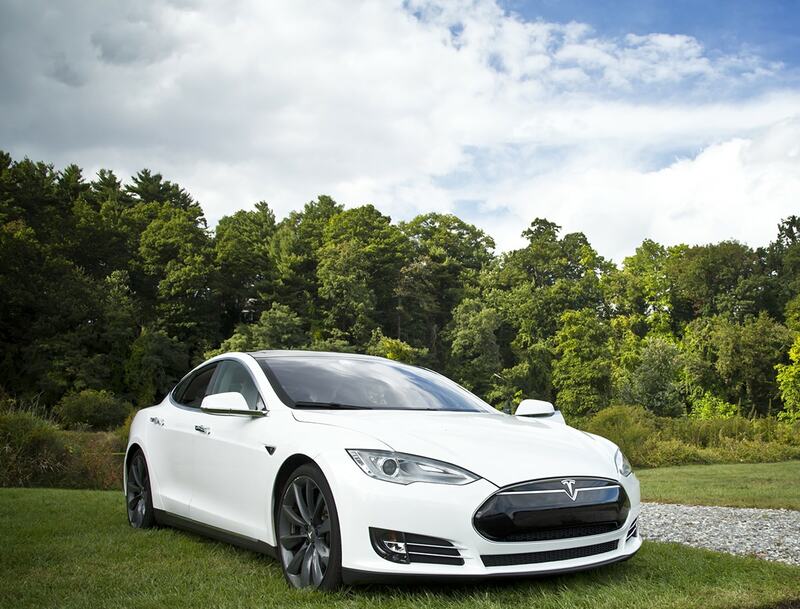 Since electric cars use fossil fuels to run, the car owner is not subject to the constant fluctuations in gas prices. According to a study completed by The Institute of Transportation Studies at UC Davis, driving an electric car saves a driver over $1,000 in gas money every year. In addition, a driver saves money on routine oil changes and other such service checks. With no tailpipe for pollution, the electric car creates much less emissions, compared to a typical gasoline powered car. However, in the production of electricity for the batteries themselves, pollutants are produced. But it is still fewer pollutants created, compared to a gasoline powered car. An electric motor with the same horsepower as an internal combustion engine will have a better torque ratio. This allows an electric car to accelerate faster – relative to a similar gasoline powered car. With the many advantages outlined for lithium-ion batteries, it’s important to note that there are certain disadvantages and drawbacks as well. However, as battery technology is further refined and advanced, many of these highlighted shortcomings will no longer be relevant. Lithium-ion batteries are prone to combustion reaction, where the battery simply explodes. This is due to a short circuit or overcharging in the electric circuitry. When a lithium-ion battery short circuits, the battery temperature quickly climbs to hundreds of degrees from the high electric current running through the battery, sourced from the high energy capacity of the batteries. As a result, the neighboring cells are heated to very high temperatures, which can then lead to the battery exploding. Therefore, climate control is required with electric cars in order to ensure the electric circuitry is not compromised in any way, since batteries are sensitive to both heat and cold; unlike a gasoline powered car, which works fine over a large temperature range. Furthermore, when lithium-ion batteries are overcharged, the chemical structure of the anode and cathode are ruined, and some of the lithium ions form ‘dendrites’ – snowflake shaped lithium metal deposits – which become another source for short circuits in the electric circuitry of the battery. The short circuits can lead to the battery catching fire or even exploding as noted. Also, any impurities in the lithium metal have the chance to contaminate the battery and lead to the formation of dendrites, which again, can lead to explosions through a short circuit. Below pictured we can see the dendrite growth in the cathode. 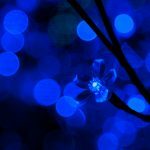 The blue waves, dendrites, that we see creeping up from the cathode can inadvertently connect the cathode and anode together and cause a short circuit. One solution to this problem is redesigning the battery using plastic and carbon insulators between the anode and cathode, to prevent dendrites from connecting the anode and cathode together. For ideal operation, the greater the durability of the battery, the longer the battery life will be. With constant deep cycles of lithium-ion batteries, the battery capacity rapidly decreases. In addition, in cold climates, lithium-ion batteries decrease in power. This is a limitation that will need to be overcome in battery technology for winter months and for many consumers who do not live in year-round hot climates like in Southern California. However, on the flip side, with too much heat, the battery will not remain as reliable as originally designed. Currently, climate control technology is required and used to maintain the desired battery temperature for maintaining peak battery performance. It’s important to note that the durability of these batteries is slowly improving, with guarantees of batteries powering electric cars to reach 100,000 miles, or be driven for 8 to 10 years before a replacement battery is required. With improving battery technology, battery life spans will increase, creating the same flexibility that gasoline engine cars provide us with today. In the meantime, greater research is required to understand how batteries behave in different conditions and climates for improved optimization. Thus, to compensate for this loss in capacity over the life of today’s batteries, manufacturers increase the size of the batteries in order to allow for a set level of degradation within the battery’s life. The degradation is not a steep falloff over the life usage of the battery, however. Reviewing data provided by Tesla, we see a battery degradation of approximately 8% at 100k miles. Battery degradation drops the most in the beginning stages of the battery. Thus, it would not be too uncommon for batteries to have 75% to 80% capacity at 250,000 miles, which we will further discuss in greater detail below. Now, that’s not a bad tradeoff considering most gasoline engine cars today have all types of problems once they reach the 250,000 mile mark; and that’s if they even reach that mileage milestone [https://electrek.co/2016/06/06/tesla-model-s-battery-pack-data-degradation/]. By looking over data collected by Tesla regarding their vehicles, we see that in the grand scheme battery degradation is very slow. The chart shows 95% capacity after 500 cycles, and 85% capacity after 3000 cycles, which displays improved durability of the batteries over time. A cycle is defined as the process of charging a rechargeable battery and then discharging it. The term is typically used to define a battery’s expected life. In our example, after 500 cycles, the battery’s capacity dropped to 95% of the original capacity that the battery was designed for. Digging deeper into the collected data by Tesla, we see that for the first 50,000 miles, most Tesla battery packs will lose approximately 5% of their capacity, and with the next 150,000 miles (total of 200,000 thus far), the battery will still operate with 90% capacity. And according to Elon Musk, the CEO of Tesla, a battery tested in the lab that had over 500,000 miles on it, was still operating at 80% of the original capacity. What’s more? The battery system is designed to block deep cycles, where the battery is fully discharged; where full discharges increase the rate of battery degradation. Thus, when the battery signals zero capacity, the battery in fact still has power left; however, the power cannot be tapped into in order to preserve ideal future battery performance. In the Netherlands, Merjin Coumans is constantly updating data over the Tesla Model S on the Dutch-Belgium Tesla Forum, which was created by Matteo. 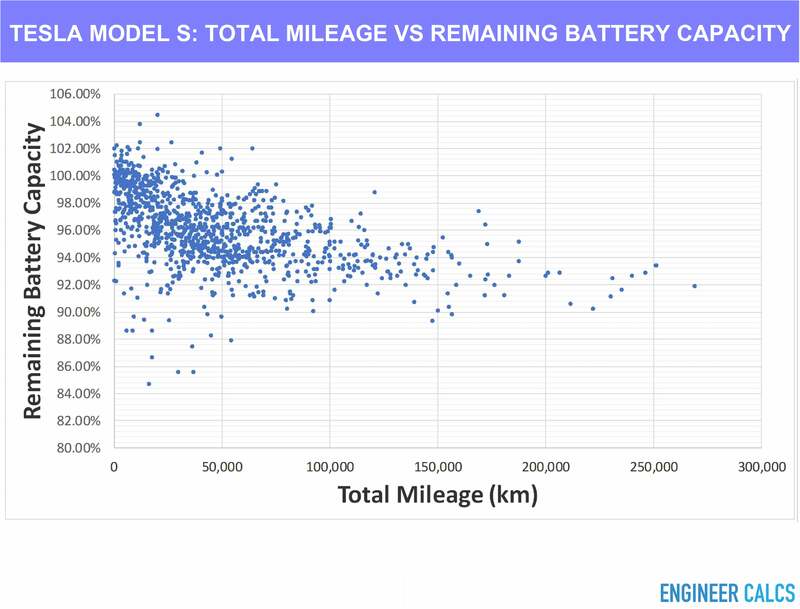 A portion of the outputted data is displayed below in the scatter plot, which represents the comparison between total car mileage versus the remaining battery capacity of each respective car. Further data and explanations are provided on the Google document file sourced from the forums, to better understand and interpret the plotted data and much more. Looking over the below scatter plot now, we see that even with high mileage the Tesla Model S car batteries do not degrade very much. Even at 200,000 km plus driven, the battery capacity is still above 90%, which is fantastic. This shows the improved durability of today’s rechargeable batteries, namely through the usage of lithium-ion batteries. However, as we have learned, these batteries still have much room for improvement and optimization, which further makes electric cars the vehicles of the future as batteries are further refined and improved. Now, to showcase room for improvement that is possible with batteries, we will look at how much battery technology needs to further improve before the amount of energy a battery can hold in weight, catches up with an internal combustion engine. Thus, referencing the energy output per battery weight, a battery only generates 1% the energy of fossil fuel. A quarter of a gallon of gasoline generates approximately 12kW of energy, compared to a 2.2 pound battery that outputs approximately 120W of energy. On the flip side, an electric motor is roughly 90% efficient, compared to an internal combustion engine that is around 30% efficient. This illustrates how the energy storage ability of a battery still has a lot of room for improvement and a high ceiling; thus showcasing how electric cars are the future to our transportation system. Lithium-ion batteries are expensive. They cost four to eight times as much as a lead acid battery and one to four times as much as a Nickel Metal Hydride battery. However, with the increased application of lithium ion batteries across the globe, the cost of these batteries will slowly decrease, which in time will make electric cars much more affordable if the physical supply of lithium does not become scarce. Looking over data provided by Bloomberg New Energy Finance, we see how lithium-ion battery pack costs have steadily been decreasing over the years. The cost has gone from $1,000/kWh in 2009, to a little over $400/kWh in 2017, and the price is projected to further significantly decrease for the foreseeable future. In tandem to the drop in battery costs, we see that the annual battery production is steadily increasing and is projected to further increase for the foreseeable future as well. 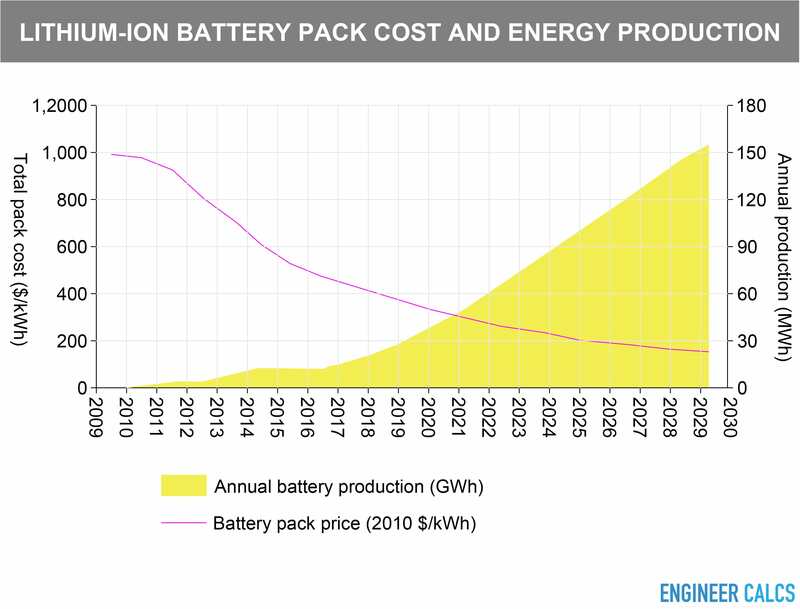 This relationship between battery costs and the demand for energy production is made very apparent from this graph, which helps us better understand why the cost for battery packs is decreasing. So we will need to wait and see how many more technologies will be taking advantage of lithium-ion batteries as time passes. Currently, our smart phones, and many other devices, are utilizing these batteries; and as battery technology improves, many other consumer and industry related products will begin to use lithium-ion batteries too. In turn, technologies around discovering and extracting lithium will improve in parallel. Lithium-ion batteries are still expensive, which in turn makes electric cars expensive; as these batteries must be replaced every 8 to 10 years. Thus, if you are modeling the cost of ownership and crunching numbers before you purchase, you should factor in a new battery pack after 10 years. 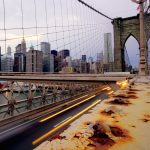 While noting that the cost of lithium-ion batteries, cost per kWh, is falling at approximately 14% annualized since the last 10 years [https://cleantechnica.com/2015/03/26/ev-battery-costs-already-probably-cheaper-than-2020-projections/]; thus, looking into the future, the price of batteries will drastically reduce. However, with mass adoption of electric cars, the demand for lithium-ion batteries will increase, thus, the drop in price of lithium-ion batteries will probably not steadily continue to decrease at the same 14% annualized rate. However, with improved battery and electric car technology, and mass production, the cost for an electric car will slowly decrease; and a consumer can purchase a luxury or mainstream version of the electric car that best fits their budget. Electric cars are the future, and the batteries that power these amazing futuristic cars will catapult the technology to the masses. Soon we can drive cross-country effortlessly with our electric cars, as constant research and development is being made, improving and enhancing our driving experience. It’s only a matter of time that this technology will have finally gone mainstream, and gains unparalleled momentum across the globe from both car and non-car enthusiasts. Not only will the world’s pollution decrease, but our transportation paradigm will shift too, with transition made to all electric cars. In hand, our other modes of transportation will then soon utilize this technology, in order to further decrease our dependency on fossil fuels. We are living in amazing times, and all of it has been made possible by the synergy of improved battery technology, coupled with well-engineered motors, and our love for never remaining complacent with an existing technology.